The “tiny home” movement is sweeping North America — many people are beginning to embrace a simpler way of life. They’re moving to homes that count their square footage in the hundreds rather than the thousands. They realize that happiness can be achieved with far less than they might have originally thought. But tiny homes are nothing new. People have lived in tiny homes for much of human history — and millions around the world still live in homes that we would consider “tiny” by North American standards. Here are a few remarkable photos of tiny homes from around the world. 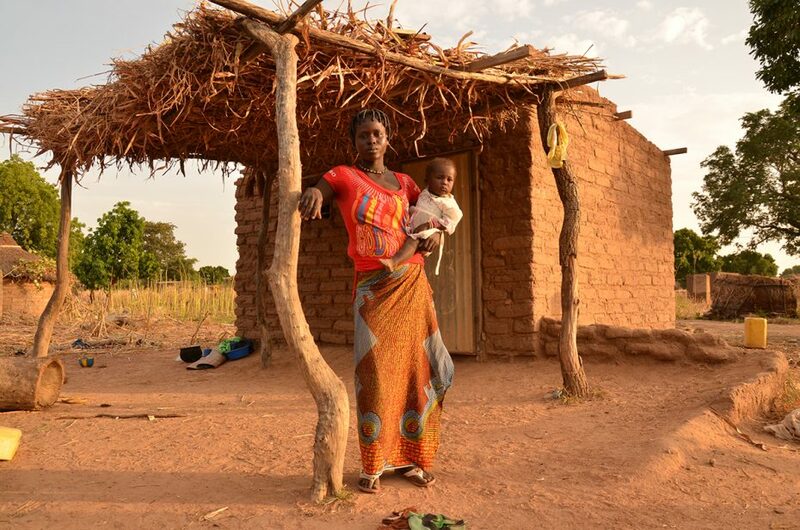 Helene Bonkounjou, 20, stands outside her small home made from mud bricks in the countryside of Burkina Faso. 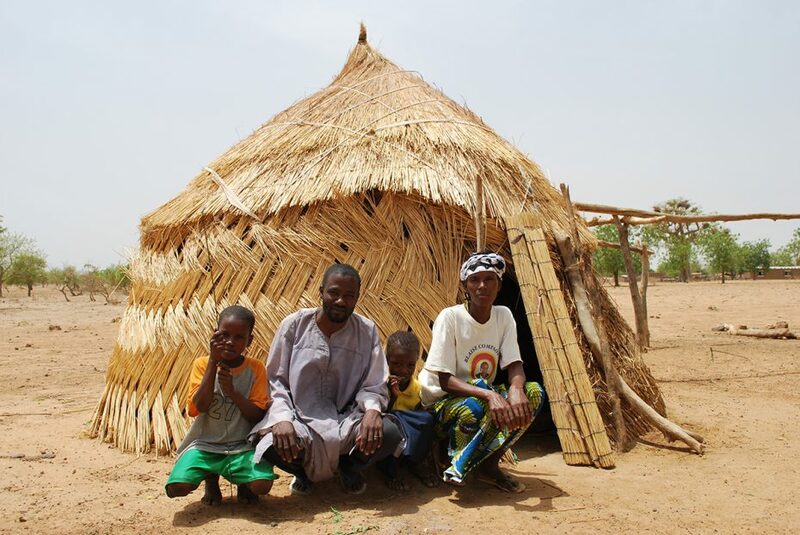 This country in West Africa often has high temperatures in the upper 90s, so the family stays out of the hot home during the day, staying in the shade of the thatched entrance. 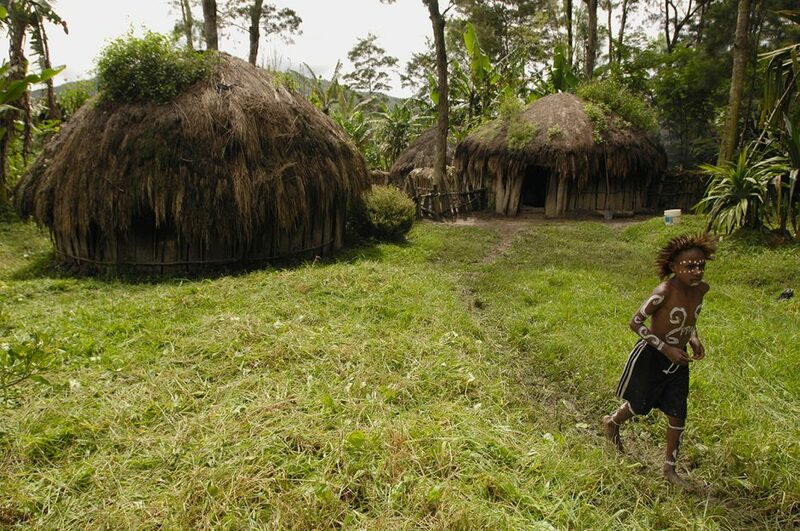 In Papua, Indonesia, some families still live in the traditional homes called “honai” made from wooden slats and thatched roofs. Traditionally, fires are built in the center of the round homes. 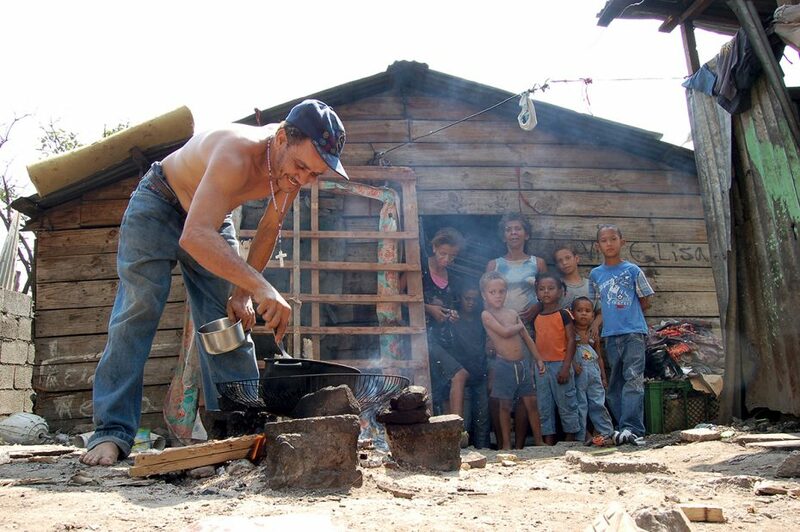 A father in the Dominican Republic cooks a meal for his family in their front yard. Many homes of those in extreme poverty lack an indoor kitchen, so families cook outside over fires. 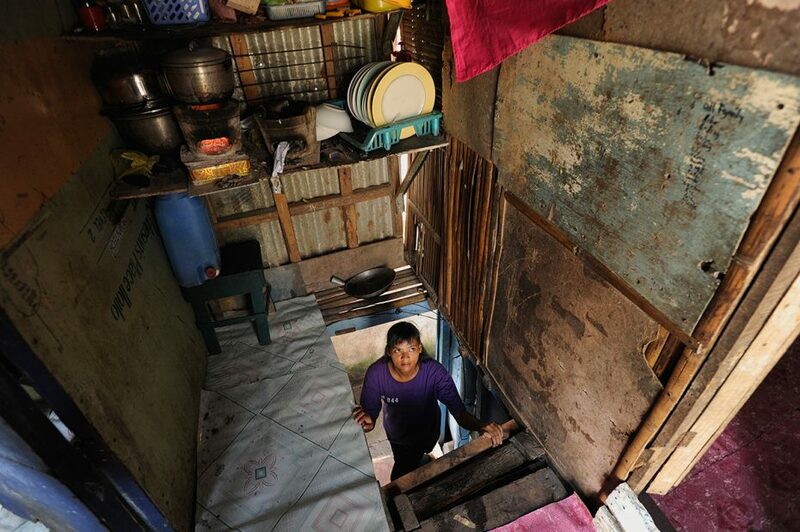 In slums in Manila, Philippines, homes are stacked onto several narrow levels. 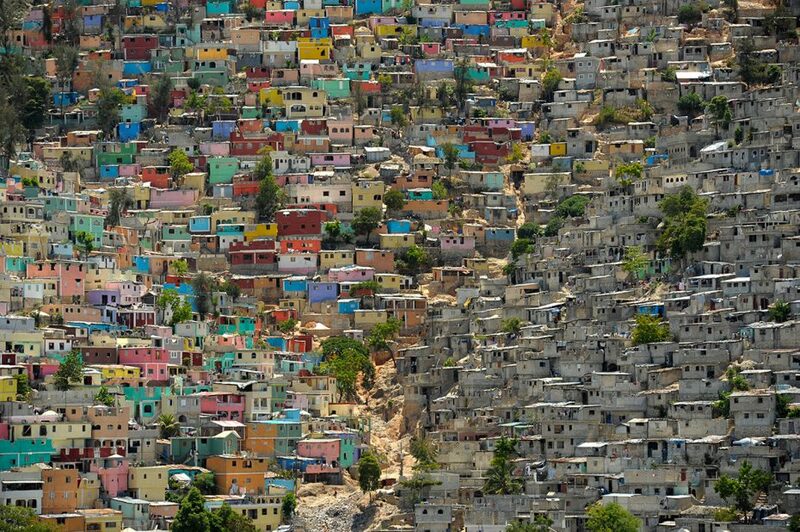 In Port-au-Prince, Haiti, tiny, colorful homes are built very close to one another on the hills surrounding the city. 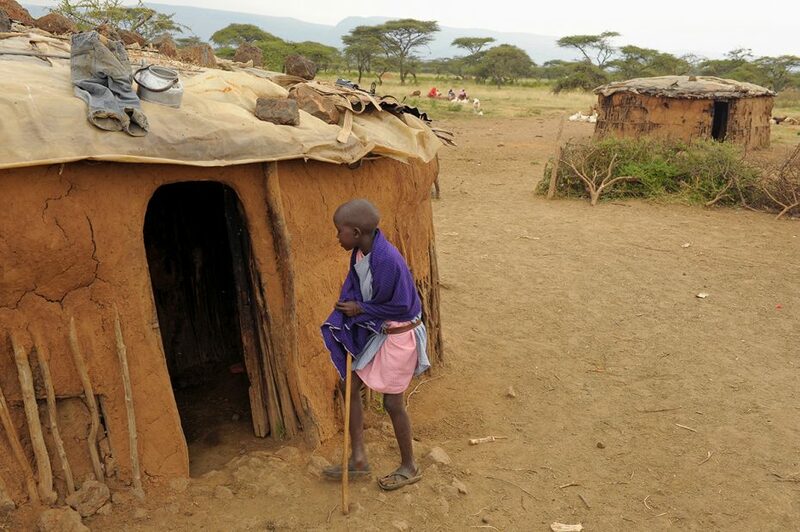 The Maasai tribe in Kenya live in manyatta, a grouping of small homes made from mud, cow dung and sticks. The homes are grouped together in a compound to help protect them from wild animals. In this tiny home in Thailand, the thatched roof is used to store toothbrushes and toothpaste. 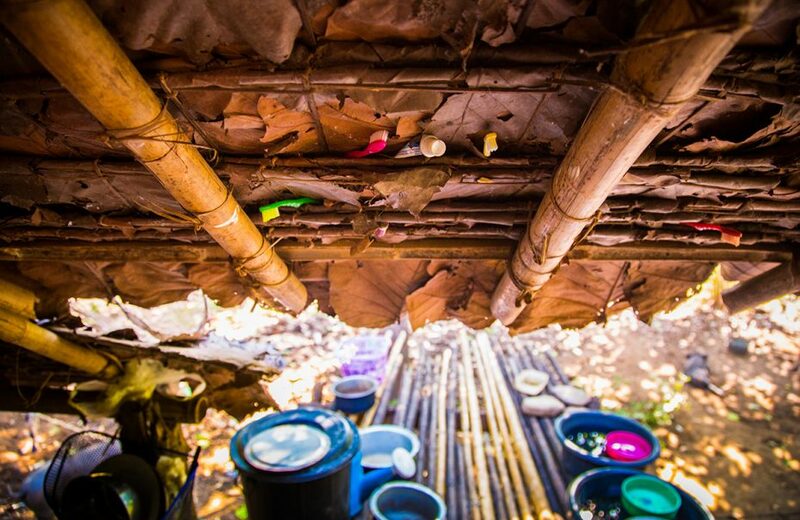 Buckets are placed below the bamboo logs to catch rainwater for use in the home. In rural Burkina Faso, some homes are made from woven reeds. This kitchen in a tiny home in Nicaragua is typical for many families living in poverty in the country. In the highlands of Peru, where temperatures can dip below freezing, families knit their wood homes as tightly as possible to keep out the cold winds. Many homes in the Dominican Republic are painted in cheery colors. Many people in the Dominican Republic still live on “bateys,” abandoned sugarcane factories where companies built small homes for the factory workers, which lacked most services. But there are drawbacks to these “tiny” homes. We don’t need big homes to live happy and fulfilled lives. 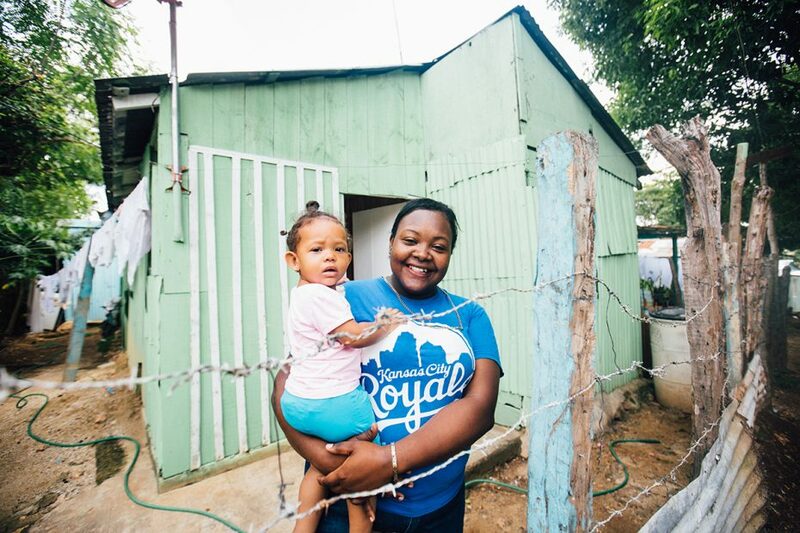 But while the tiny homes of North America often have all the amenities, there are a few things lacking within the tiny homes that many children in poverty live in around the world. 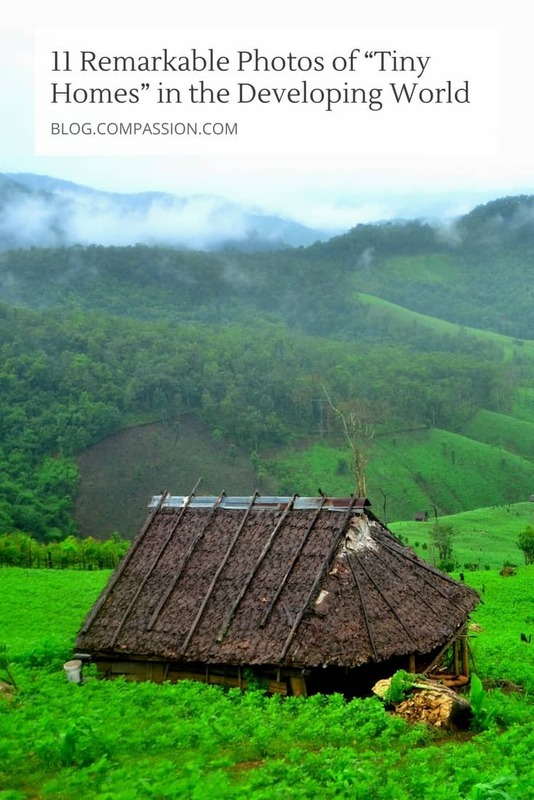 Some rural communities around the world still use thatching for roofs. Although they look quaint, thatched roofs can house insects such as fleas which can negatively impact the health of the people living in the house. Thatched roofs also can leak in heavy rains and need to be repaired or replaced often. Other families in poverty rely on metal sheeting for roofs. These are an improvement to thatched roofs, but as these age, they can also leak and are drafty in cold weather. Many homes around the world have dirt floors rather than improved flooring such as concrete or wood. When it rains, the floors can become muddy and attract insects. Diarrhea and respiratory and parasitic diseases spread more easily in homes with dirt floors. 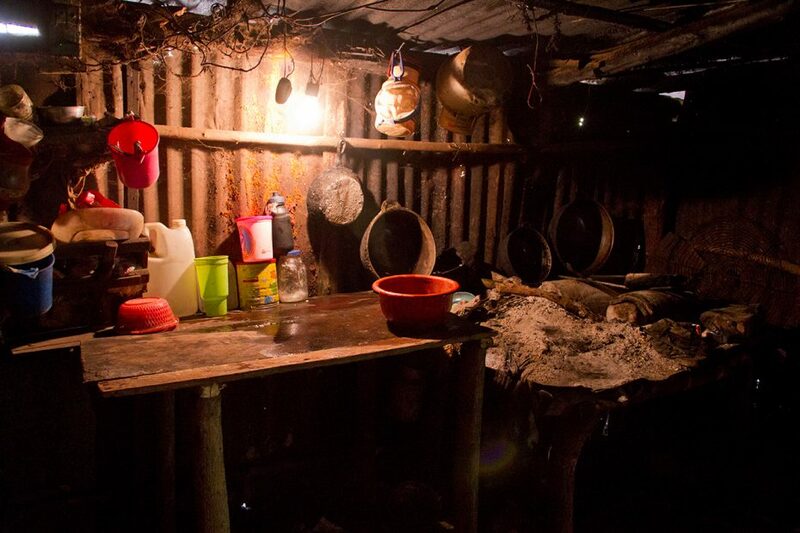 Many homes of those living in extreme poverty lack electricity. Beyond the practical inconveniences, this seriously affects health as well. Often families will have indoor fires and kerosene lanterns, which contribute to indoor air pollution and can cause acute respiratory infections — one of the leading killers of children in poverty. 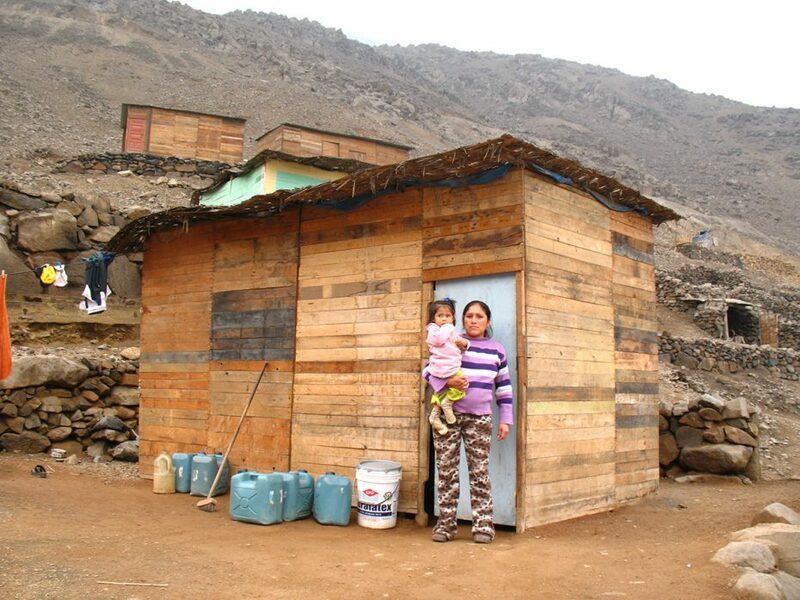 Often the homes of those in extreme poverty lack sanitary toilets, garbage collection and access to safe water. This deadly combination causes the deaths of 1,000 children under age 5 each day. Some families in poverty may use a bedsheet or other material in place of a door. Those who have a door may not have one that locks securely. These families lack a sense of security that they can keep their loved ones safe at night. Moreover, these homes are also easily destroyed. Countless homes of people in extreme poverty are destroyed or damaged every year due to storms, mudslides, hurricanes or flooding. 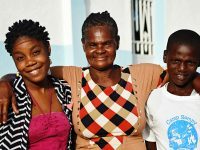 Do you want to help a family in extreme poverty rebuild a home that is safe, healthy and secure after a disaster? This was originally published on the Compassion Canada Blog. 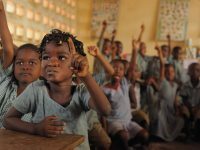 Prev Post:Agnes Hotay: How to Invest in the Leadership Potential of Young Women in PovertyNext Post:Do Children in the Compassion Program Have More Than One Sponsor? 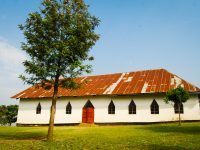 It would be great to have more pictures of sponsored kids housing. Description of their house does not always work and the internet many times does not help. I vote for more pictures of kids housing!! Hi Paula! It truly is amazing to see the homes of the precious kiddos. Thank you for your feedback!